Welcome to the beginning of the Beyond Bums event! I am very excited to be partnering with Stephanie of ClothDiaperKids.com, who is located from right here in my own hometown of Edmonton, Alberta! From Day One with her little son, Stephanie and her husband were committed to using cloth diapers, and have made their way from using a diaper service, to purchasing cloth diapers of their own to use, to now owning their very own online cloth diapering boutique! 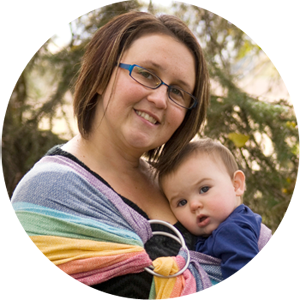 As their online business grows, they've also expanded their product line to include a variety of other terrific products for baby and mom, with a special focus on Canadian-made or Stay at Home Mom made products! Up for review, Stephanie was very keen to send me a gorgeous product that is handcrafted at home by a Canadian stay at home mom--a leather PeekPea bib! These bibs are available in both an infant and toddler fit, in a variety of GORGEOUS color combos with sweet little leather appliques on them. They have dragonflies, ladybugs, alligators, teddy bears, hockey sticks, and many more colors and designs perfect for a little boy or little girl! This bib is basically the one bib you will ever need. It is completely wipeable and will not stain (I dropped everything from spinach to blueberries to spaghetti sauce on ours, and it never absorbed any stains!). There is also a heavy-duty, reversable pocket (which can flip around to the other side if you like, or can flip inside out for easy emptying) for catching crumbs and spills and keeping them off of little laps. When this pocket gets flipped to the backside, the bib becomes completely reversable and has a whole other look with a new solid print on the backside. My favorite feature of this bib is the magnetic neck fastener. Previously, I had used all bibs with velcro closures, and I found that they would frequently scratch at Baby A's neck when she was eating (or tugging on her bib), leaving nasty gouges or redness after dinner. All the velcro would also often come unfastened in the wash and snag on her other cute clothes. 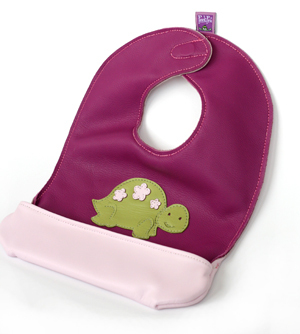 The magnetic closure on this PeekPea bib, however, is completely sealed off between the layers of leather and is completely no-maintenance. I can easily fasten or unfasten the bib even using one hand (when my other hand is covered in sweet potatoes!). It's a great feature that I totally love, and since this bib never needs to go in the washing machine, the magnet is a perfect fit for its design! My only reservation about this bib when I first read about it (before trying it) was the price--at $34.95 for the infant style and $39.95 for the toddler style, I was concerned that this was a pretty steep price for a bib. However, now that I've used it, I have to say that I have found that price would still totally be worth it for a few reasons--the bib is heavy duty with terrific stitching, design, and workmanship. But, more than that, this bib can replace ALL your other bibs that you currently have to worry about constantly washing and keeping clean! Before I used this bib, I was still using cloth infant bibs primarily, stockpiling PACKS of them because I was dirtying 3 of them daily! That added up to a lot of laundry (and, sadly, also a lot of velcro snags in the wash!). Now, I have literally packed all those bibs away for hand-me-downs to new friends, and I am exclusively using this bib 100% of the time. It wipes clean and dries within a moment, ready to be used again next time. It folds flat in the diaper bag for when we need to go out, and the pocket is far superior to any that I've ever seen on other pocketed bibs in the stores. 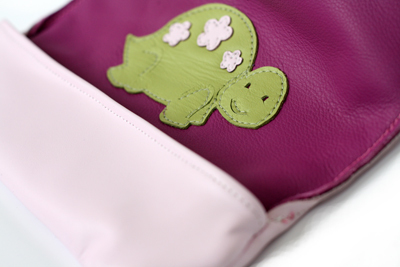 The wide, sturdy, reversable pocket never missed a spill for us! Overall, this is a lifesaver of a baby product, having saved so many outfits from stains (with its wide spread all across the chest & shoulders), and its cute, unique design. 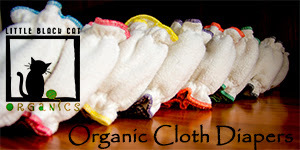 I also love supporting two great homegrown, Canadian mommy business--Cloth Diaper Kids, and PeekPea! 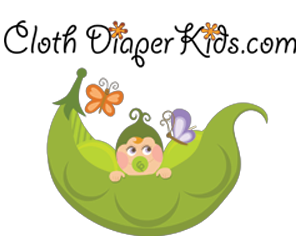 BUY IT: Visit Cloth Diaper Kids to pick out a gorgeous PeekPea bib in the perfect size and design for your little one! Thanks for sharing this one. I was able to buy this kind of design and I really like it a lot.